You Are Here: Home » High Index Lenses » When Should You Switch a Child from Normal Glasses to High Index Lenses? Almost all families have at least one person who wears glasses and most have several. While near- and far-sightedness often run in families, the variance between even two people with the same parents is sometimes significant. For bespectacled parents of children who wear glasses, there’s always the rueful relatability. You know what it’s like to wear glasses as a child and throughout school and while it would be great if they had perfect vision, it also means they sort of know what you went through a long time ago. The real question for parents of children with glasses is when to graduate them from one stage to the next. This often depends on the age of the child when they started wearing glasses, their age now, and how responsible they are as individuals both with the glasses and other aspects of their life. 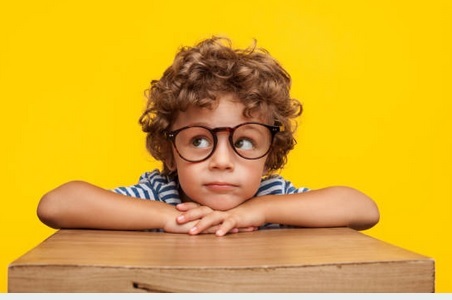 Some children will be ready to graduate from ‘little kid’ glasses so something classier and more expensive by the age of six or seven while others might need sturdy rubber-tipped safety glasses well into their teens simply due to a preferred lifestyle. Children who get glasses when they are very young usually start with something plastic or even some of those uniquely flexible frames that don’t break when you bend them the ‘wrong way’ as children will do when playing with everything including their eyewear. As they get older, a child’s sense of style will develop along with some early indicators of how active or careful they will be with new glasses. Eventually, they get to grow up from ‘little kid’ plastic glasses to ‘big kid’ metal frames or subtly designed plastics depending on their preference. Eventually, somewhere between ten and twenty (the range really is that big), your child will decide they’re ready for more refined adult glasses with all the perks and possibilities that come with it. Many people imagine vision as deteriorating from childhood to adulthood and this true for a number of people, but the range is often not what they expect. Small children are absolutely capable of having very near- or far-sighted eyes that need correction early before they can learn and play effectively with other children. These kids usually grow up to progressively thicker lenses until their eyes mostly settle around adulthood. These children, more than any, could benefit from high index lenses but only when they’re ready. High index lenses are made of special lens materials that bend light more efficiently than normal glass or plastic lenses. This means that lenses made to be high-index require less material for the same quality of vision correction resulting in much thinner lenses. However, deciding when to invest in the somewhat pricier lens types is always a rough debate for parents who see their children struggling with thick lenses at school and play. There are a few important questions to ask yourself and your child before deciding that it’s time to switch to high index lenses. While all children are energetic and playful, each child also has their own individual level of energy and desire for exciting activities. To put it simply, everyone loves recess but some kids spend it sitting in a circle or playing jump-rope games and some kids play soccer like getting grass stains is their purpose in life. The calmer your child is on most occasions, the more likely they are to be ready for high index lenses for their every-day frames. However, if your child loves rough-and-tumble play and their thick lenses are becoming a problem on the field one way or another, there’s another interesting option. 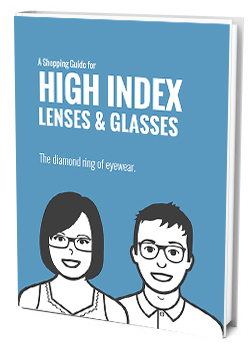 Polycarbonate lenses, made to be incredibly sturdy, are of a slightly higher index. You might consider a pair of safety/sports designed frames with polycarbonate lenses to help your active child maintain visual clarity on the field where its needed. It’s a commonly known problem that some children inexplicably decide that they hate their glasses and refuse to wear them. Some even go through a passive-aggressive phase of hiding and ‘forgetting’ them, sometimes in dangerous places. While this is more common among children with weaker prescriptions who can get along mostly fine without their glasses, sometimes children with thick lenses will go through a similar experience, choosing the natural blurriness to the perceived hassle of glasses. If you’re still training your child to wear glasses, it’s probably not the best time for high-index lenses unless you’re sure that the thinner lens will help convince your child that glasses aren’t so bad after all. On another note, if your child really does enjoy playing with their glasses off, this is your chance to do a little corrective therapy by practicing seeing and reacting to distant stimuli and peripheral details. It will actually help them in the future. Maybe your child loves their glasses, wears them every day, and is eager to get thinner high-index lenses and they promise to take extra good care of them. Even in this situation where your child seems in every way ready for the upgrade, your final question is one of responsibility.Some children are energetic and/or incautious with their things in a way that causes them to break quite frequently. Whether they tend to fidget things apart, accidentally sit on them, or simply lose their glasses from time to time in unlikely places, if your child is not yet responsible enough to care for a pair of glasses then the high-index lenses should wait another year. On the other hand, many children are tidy, organized, and treat all their possessions with respect and care or at least they eventually learned to after you cleaned their room with them a few times and explained why everything has a place. If your child is careful and responsible with their items, they’re probably ready to take care of a pair of high-index eyeglasses even at a fairly young age. When your child finally reaches the right point of care when playing active games, desire to wear their glasses, and ability to track and take care of them, it’s time to take them in to the optometrist again. Armed with a fresh new prescription, the two of you can spend a few minutes to a few hours pouring over frame options and discussing which frames will look best on their face with the new slimmer lenses. Once you’ve chosen the frames and the index you want, you might even consider talking to them about each of the important coatings and deciding which ones they want. Anti-reflect is always a good choice with high-index and anti-scratch is important for almost any child no matter the lens type. Children grow up at different paces. Some are very mature at a young age and some stay wild for a good long time. No matter how your child grows up, if they wear thick glasses then high-index lenses are a great upgrade whenever they’re ready. When you think it’s about time, you can always use the explanation for why high-index lenses work as an opportunity for a quick lesson on optics and light.